Ever since he was a little baby, my son has adored trains. He was born in London, and I attribute his love of trains to the fact that throughout my pregnancy and for the first few months of his life, we rode the Central line of the Tube everywhere. As a toddler in Chicago, he was thrilled at riding along on the elevated tracks, through the Loop. He’s ten now, and while he no longer plays with his Thomas and Friends wooden train set, he is still fascinated by trains. It also looks like he’s passed the train loving torch onto his little sister, age 2. Do you have a train lover in your family, too? 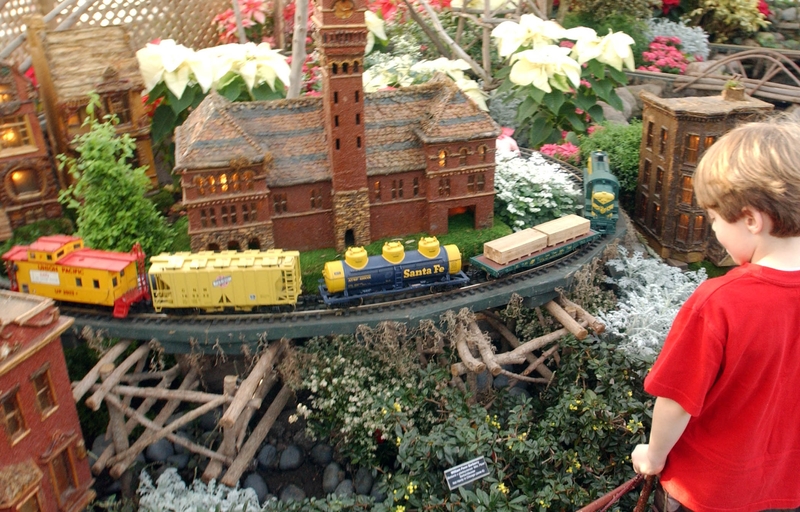 Then don’t miss the Lincoln Park Conservatory Winter Flower and Train Show through January 1o. Take off your winter coats and enjoy the warm, fresh-spruce scented, oxygen-rich air as you watch tiny trains make their way through flowery forests, over rivers and lakes, and past a little Chicago fashioned out of natural materials. The brilliant poinsettias in the showroom make the perfect backdrop for a holiday family photo op! While you’re there, step into the other rooms of the conservatory. The fragrant orchids and lush ferns will transport you to Hawaii. Can you spot the bug-eating Venus fly trap? the Koi swimming in their tiny pond? the plant that is sensitive to your touch? Lincoln Park Conservatory is located just next door to the Lincoln Park Zoo, on the southeast corner of Fullerton and Stockton, just five minutes north of downtown. The Winter Flower and Train Show is free and open every day through January 10th, from 9 a.m. to 5 p.m. Admission, as always, is free. For more information, contact the Chicago Park District at 312.742.7529. This entry was posted in Family and tagged Lincoln Park Conservatory, Winter Flower and Train Show, winter in Chicago. Bookmark the permalink.